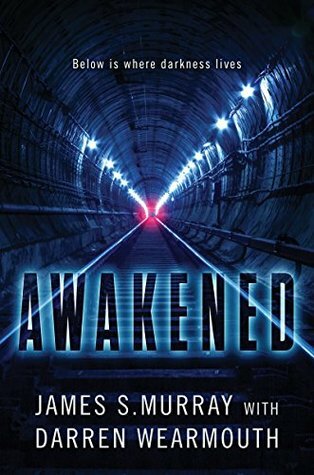 Awakened is a non-stop, pulse-pounding thriller that takes you on the subway to hell. You may need to leave the lights for this one! First off, I want to thank Harper Voyager, Edelweiss, and the authors for an eARC of Awakened in exchange for an honest review. Receiving an eARC does not sway my opinion on the novel and the thoughts below are mine alone. When I first heard that James “Murr” Murray, aka James the Ferret, aka the losingest member of the Impractical Jokers crew on TrueTV, was writing a novel, I jumped at the opportunity to request a e-copy from Edelweiss because I am a YUGE Jokers fan (shout-out to my buddy Paul for introducing it to me several years ago); not to mention that one of my favorite science fiction writers, Darren Wearmouth, was also tabbed. Though I did go in with a few hesitations, considering Murray makes his living yanking cigarettes out of smokers hands on the streets of NY or pinning balloons on unsuspecting shoppers in grocery stores, I was pleasantly surprised by what I read and am looking forward to the next book in the series. New York and its surrounding communities have been awaiting a new and improved subway line for some time; one that will streamlines travel across the Hudson River (well, under it). Well, the day is finally here. News stations, camera crews, workers and visitors alike, even the Mayor of NYC and the POTUS, are gathered around the grand pavilion to mark the maiden run. The train has pulled in but their isn’t a soul on-board. Blood and gore cake the interior walls, windows, and seats. All in attendance panic and begin running for their lives, believing this is another act of terrorism. But when otherworldly screams and screeches begin emanating from within the tunnels, those thoughts are put to rest and a new fear begins to creep in. Phew. This one had me on the edge of my seat for a while. The reader is thrown directly into the action within the first few pages and the onslaught continues until the last few. We are introduced to a slew of characters in the beginning that we continue to see throughout, giving their unique vantage points of the situation at hand. There isn’t one I can particularly pinpoint as an “investment”, but I didn’t really come for the characters. I came for an exciting and gripping story-line, and it did not disappoint. There is also an underlying story that slowly unravels itself and blindsides you at the end; it is definitely worth the wait. Just FYI, there is a good bit of language and gore, but you have to expect that with this type of novel. I would highly recommend this novel to fans of books like ‘The Strain’ by Chuck Hogan or ‘The Hell Divers Series’ / ‘The Extinction Cycle Series’ by Nicholas Sansbury Smith; or if you are a movie lover, fans of Alien mixed with The Taking of Pelham 123. Go preorder your copy today! Absolutely! Let me know what you think once you have had a chance to read it!